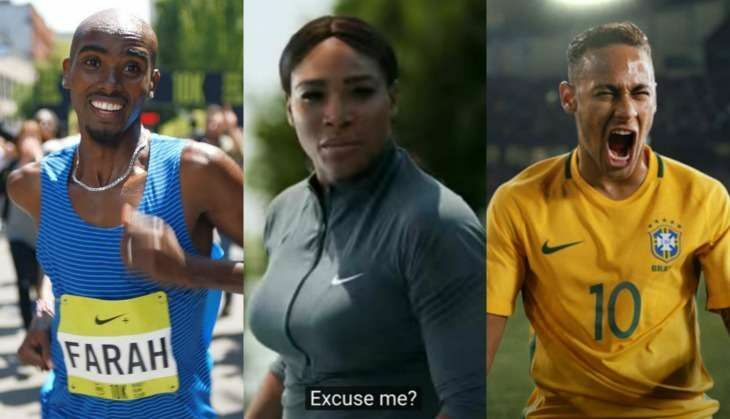 Lately, Nike's adverts have been killing it. Think Da Da Ding wasn't all it was made out to be? Sure, your perspective's fine too. But hey, they made you sit up and pay attention, didn't they? That's half the battle won, say the copy writers. This ad may not bada boom bada bing, but that isn't to say it doesn't pack a punch. What starts off as a narrator flipping through the stories of a bunch of amateur sports enthusiasts, will have your heart racing once Serena and company get into the picture. 'Life isn't about finding your limits. It's about realizing you have none,' says the descriptor below the video on Nike's YouTube page. And as you watch Serena Williams practising with baseball player Giancarlo Stanton, Neymar Jr doing what he does best - score a goal, and skateboarder Nyjah Huston do a stunt that threatens to give you a stroke, you realise that the only one putting a limit on your accomplishments, is you. READ NEXT >> This is what Akshay Kumar, Hrithik Roshan are tweeting about each other's films!